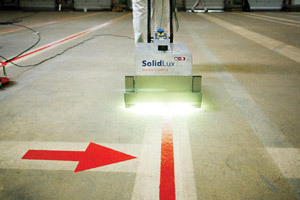 Back in February 2016, the innovative Dutch paint manufacturer Van Wijhe Verf, from the Netherlands, introduced a breakthrough in the area of industrial floor coatings: SolidLux Instant Coating. It proved an immediate hit amongst customers and after a warm reception in his home country, the coating was introduced into the UK in February 2017. SolidLux is a unique and patented opaque floor coating. It cures instantly at the speed of light under Decorad portable UV lamps and is immediately resistant to intensive mechanical and chemical stresses. Whether for use indoors or outdoors, it is an ideal solution in any situation where floor maintenance or renovation work will inevitably disturb the regular activities and often lead to associated loss of income and other expenditures. Thanks to its instant curing ability, it means the floor coating can be applied practically while business continues as usual with little to no disturbance. A smart working sequence allows car parks, production areas or concrete stairways to be used with practically no disruption while being treated. In many cases this will eliminate the need for expensive temporary provisions and ensure profits are maintained. The coating system (SolidLux Basecoat and Topcoat) consists of single component products only, with related environmental and efficiency benefits: solvent-free, minimal loss of material and less application equipment needed. In all, this significantly cuts down on environmental impact and produces less waste. SolidLux services clients through an Approved Applicators Network. Currently there are 3, who between them cover the whole of the UK with dedicated SolidLux teams. These teams are experienced in all facets of the specific coating and Decorad UV-technology and thus able to optimally utilise the benefits of the SolidLux system for best results. Original clients are now having additional line marking applied as we forge long term relationships. Clear demarcation between vehicles and pedestrians in the workplace plays a significant role in safety. 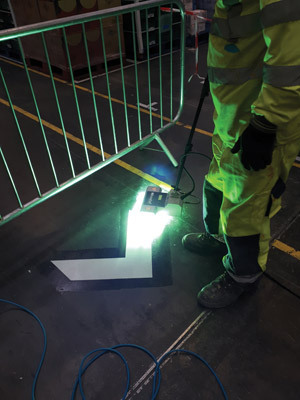 Often companies find it difficult to renew or instate new line marking, particularly in ‘Live’ 24/7 environments. 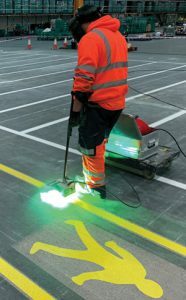 Given the constant flow of traffic and footfall of pedestrians, it is more often than not a difficult task in trying to schedule line marking that will not interrupt workers and business progress. But now, thanks to Solidlux, the process is made far easier, keeping disturbances to a minimum and maximising time efficiency. If you would like to find out how you can get your hands on SolidLux, be sure to get in contact today. Ian James, the UK Sales Manager, invites enquiries from both End Users and potential applicators, and can provide information on the many SolidLux benefits and applications. You can contact him by email: ijames@solidluxcoating.com or phone: +44 (0)7818 001141. The website www.solidluxcoating.com/en has more information.